OK, here is a rule set that I've been working on. Lets see how things turn out. Most of this will assume you already know how FoW works. This is a work in progress and is designed to make turreted tanks more useful, and to take the advantage away from assault guns. This affects all units (tank and gun teams) that previously had a 180 degree firing arc. And also tanks with turrets. The 180 degree arc will still be used to some extent. The first thing you will need is 2 Laser Levels. These will be held perpendicularly directly above the unit you are checking the firing arc or frontal armor. This will give you a 90 degree firing arc coming out at 45 degree angles from the unit. I had to draw in the lines because the laser light doesn't show up when you take a picture of it....go figure. To correctly position the lassers (remember directly above the unit) have both lasers come out the front corners of the tank. I originally thought this would give each different sized tank a unique arc, but its so minuscule it makes little difference. Its now more of just a standardized guide for this rule set. I'll try to do rules as best I can in the order they are in the FoW book. **Also keep in mind, Phil's new rule that vehicles with turrets can rotate hulls towards anything infront of their 180 degree arc, where before they had to turn their Turret. They now only turn their turret when shooting at things behind their 180 degree arc. Both Vehicles and Guns now have 2 Fields of Fire. A 180 degree arc, and a 90 degree arc. With some varying differences. All Vehicles and Guns can fire their weapons at anything inside the 90 degree arc with out penalty. 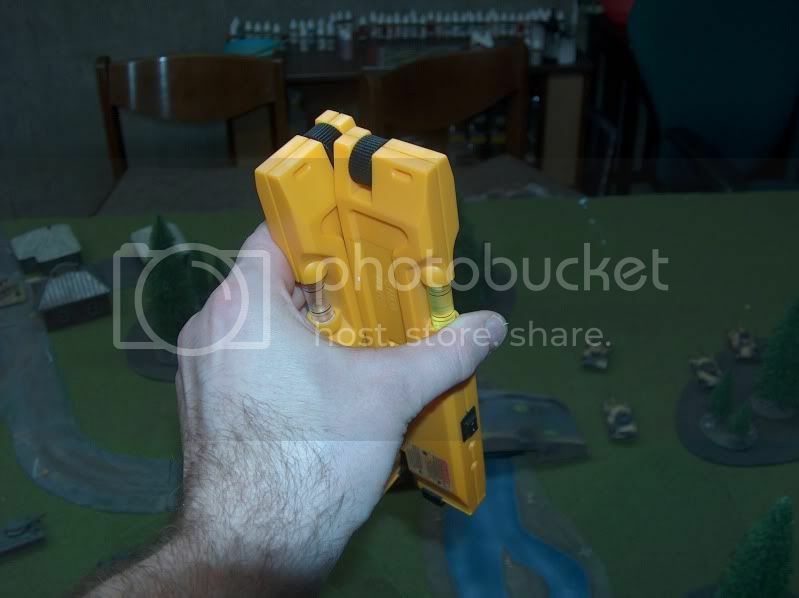 The unit can adjust to point at the target. The only proviso is that vehicles may only rotate their turrets or their hull towards the enemy, not both. There is now more strategy to which direction you face your hull. So, a sneaky player could adjust the hull for a advantageous but different direction then the target, but then still move the turret. You can still shoot at anything between the 180 degree arc and the 90 degree arc. But there are now penalties for doing so. Hull mounted weapons and guns, (remember this includes man-packed guns) will have to rotate their guns towards their target, but are then considered to have moved and shoot at a reduced RoF. Anything behind the 180 arc they still can't shoot at. Vehicles with turrets can choose to rotate their turret or their hull. If they rotate they they shoot with their full RoF. If they rotate their hull, they must rotate towards the target (not reposition as they like) and they would also be considered moved and shoot at the reduced rate of fire. Anything behind the 180 arc they must rotate their turret. Treat each weapons arc separately as in the example to the right. 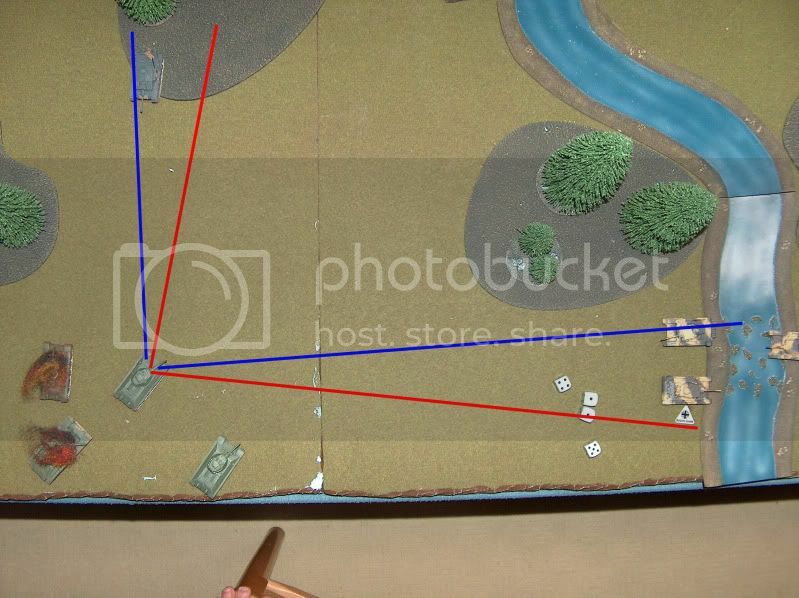 The blue line is the hull MG arc, and the red line is the turret Arc. 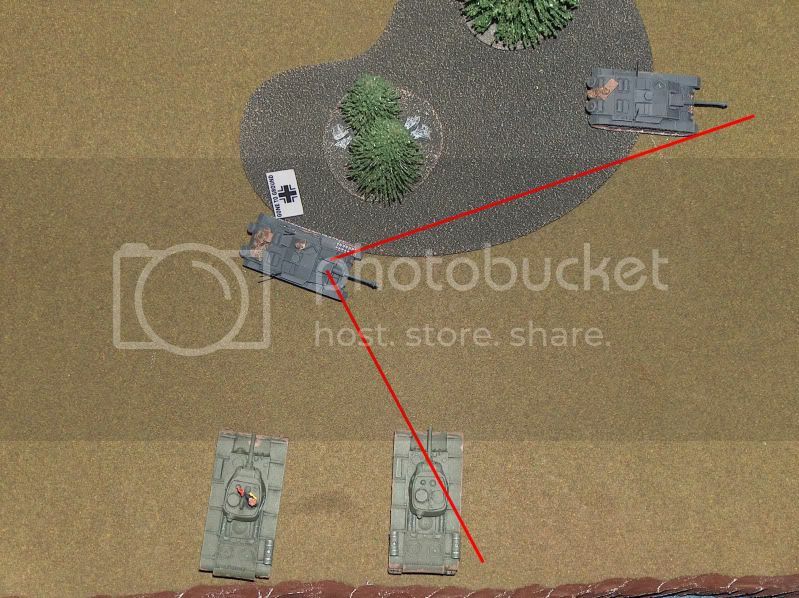 If the Hull MG points to something outside the blue arc, The vehicle is considered moved, and even the Main Gun could only fire at a reduced RoF. 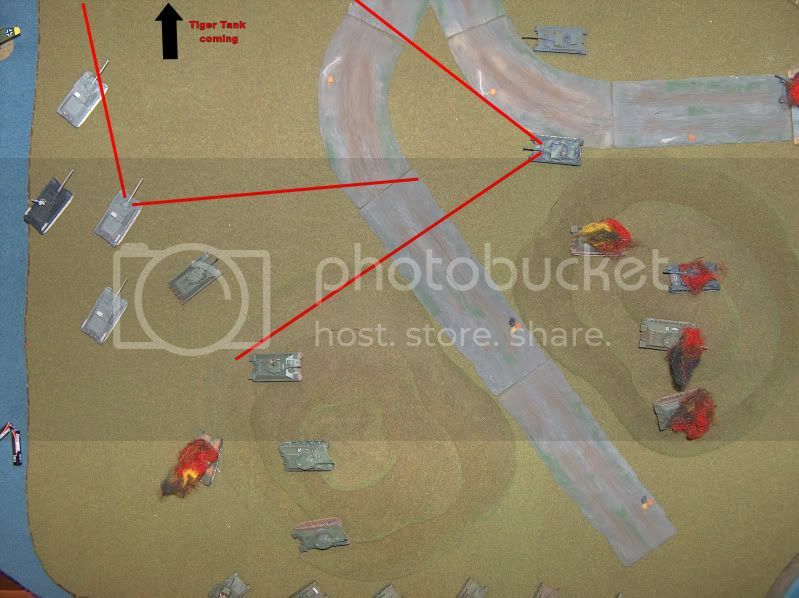 The Red arc for turrets would mostly be used for Slow traverse and limited vision. And in the case of limited vision and slow traverse, the T-34 in the example above would have to use limited vision if it shot with its main gun at the StuG to the north. But could shot normally with the hull MG. The hull MG would have to use slow traverse and considered moved, if it shot at the lower Panzer III, where the Turret guns could shoot normal. You CAN aim different weapons at 2 different targets as long as they are in the same platoon. For example a hull MG and the Main gun in a turret. Treat each weapon as if it had its own arc. If a vehicle you are shooting at is straddling the line, consider it inside the 90 degree arc. These are no based on the 90 degree arc of the weapon that is firing, and not the 180 degree arc. Even if they turn their hull. Something I never thought of, was if vehicles had already moved, how does this affect the arc. Hopefully this wouldn't come up much because the player would have adjusted what they would shoot at during the movement. But, I guess it should be noted just in case. 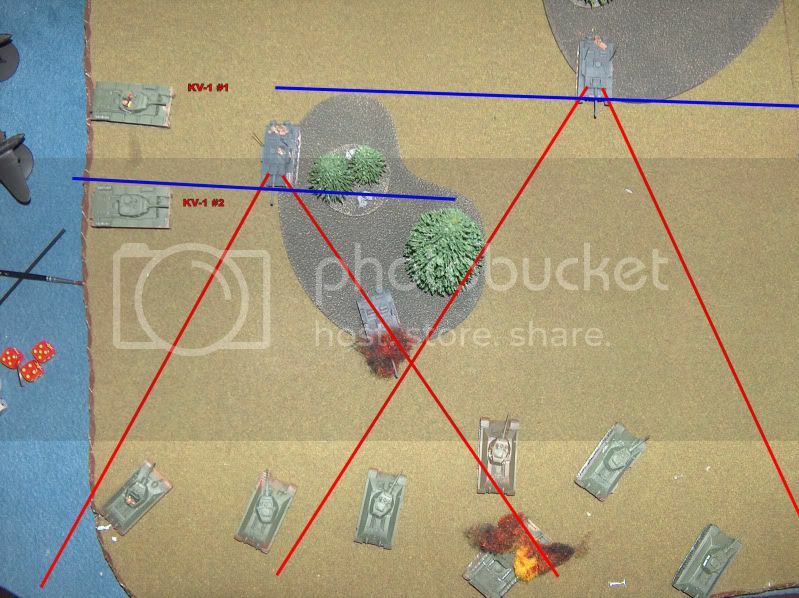 If a vehicle (or gun) moves and shoots outside their firing arc, they will already only have a 1 RoF so would have to add 1 to the score needed to hit. Just as any ROF 1 weapon needs when it moves. Weapons that already only have a RoF of 1 and move, would not be able to shoot outside their 90 degree arc at all. Also, if a vehicle or gun has to shoot outside its 90 degree arc and is in difficult terrain it would have to make a bogging check. You can never shoot bombardments outside your 90 degree arc...although I think this is pretty unlikely since most things far away will end up inside your 90 degree arc. Now, if you shoot at an armored target OUTSIDE its 90 arc, you are shooting at its side armor. This is determined by the barrel of the gun and not the tank itself. So, the laser line could run through the middle of the tank. But if the end of the barrel is outside the 90 arc, you shoot at side armor. In the example to the right, you can see that the arc clearly cuts through the KV-1s. But as soon as he turns his turret, the gun barrel will be on the other side of the line, and he will shoot at the side armor of the StuG F/8. I am undecided what to do about hitting the side of turrets. If I should give them the 90 degree arc, take out this rule all together, or leave it at 180. For now I'm going to leave it at 180. I think this makes for a far more strategic game. At least positioning your vehicles anyway. I actually still found it hard to get a side armor shot, but not impossible. It was all about how your opponent positioned his vehicles. 2 platoons could work more closely together, to force an enemy platoon to show his flank to 1 of your platoons. All while still being in front of the old 180 degree arc. It makes StuG's not as strong...and different from tanks with Turrets. Take a look at this example. The StuG's have some choices. They can just shoot at the T-34's with a full RoF, but leave their side armor exposed. Or they can rotate and shoot at the KV's. 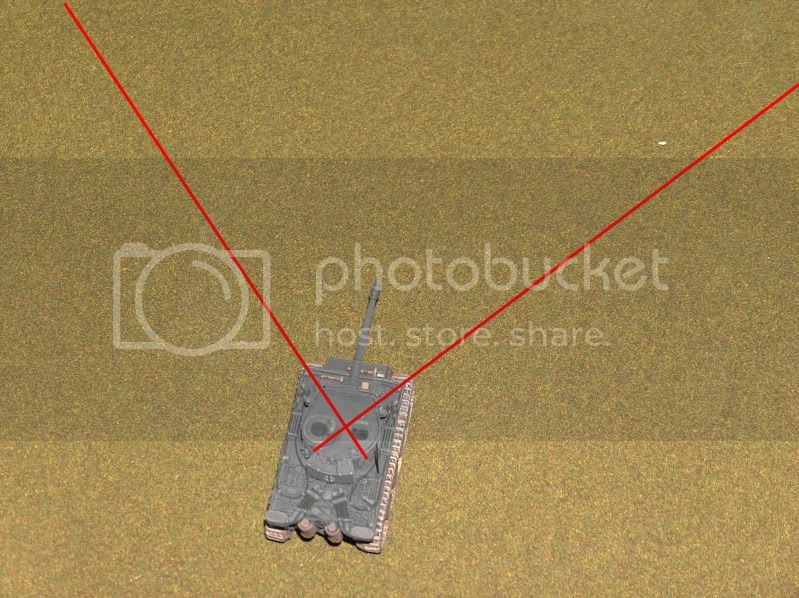 The problem now is that in order to shoot at the KV's the StuG's would end up shooting with a reduced rate of fire for shooting something outside their 90 degree arc. And more so, the close StuG could not even target KV #1 because its behind the180 arc. And the StuG's would have to make a bog check to turn toward the KV-1. Luckily, the T-34's and KV's have the same anti-tank rating so it doesn't matter...they might as well use their full RoF. The more complicated situations are already covered in the regular FoW rules. Like if you have some units of the same platoon with side armor exposed and others are showing front armor, lower armor gets allotted hits first. All in all, I really like this. I still have to do some tinkering and testing, but I think this about covers the rules idea anyway. It took a little more time, because you have to be a lot more careful how you position your vehicles. You can no longer just drive up, because EVERYTHING is always behind your 180 degree arc line. you now want to position so that you can cover as much as you can. In the next example, before the Panzer IV's would have moved forward as they are. everything in front of their 180 degree arc. But now you can see that they leave themselves exposed to the T-34's on the hill. The SU's were a little smarter. You know...if they had different front and side armor...which I totally forgot. But for this example we will assume. They knew a Tiger was coming from the north. So, they positioned themselves, so that their 90 degree arc covered the tiger coming, and the Panzer IV's. There is just way more maneuvering to get to that side armor. rather then just sitting in a tree line shooting at each other until someone rolls good dice. I've probably forgotten something, but I welcome everyone's input. If something doesn't work or I've forgotten some obscure FoW rule, let me know, and I'll come up with a solution to work with the 90 degree arc. Let me know if you want to playtest these rules with tanks... lots of tanks. ya anytime I don't have hockey or Karate. Play testing is always good. I just thought of something else I need to add. If the vehicle has already moved, and they fire at something out of their 90 arc, they have to add 1 to the die to hit. although I can't see that happening to often. and then anything with a rate of fire of 1 that already moved, wouldn't be able to shoot at all outside their 90 degree arc. I guess I would have to add that gun teams would loose their dug in status if they fire at something outside the 90 degree arc. I just thought of another situation this resolves. If you have a tank that has cover from the building, with the front part of the tank being covered by the building, you can still be in front of the 180 line and have to shoot at the front armor even though you can't see it. With the 90 degree arc, if you are with in the 90 degree arc and have to shoot at the tank in the same situation, likly to much of the tank is covered and you won't be able to shoot. but if you are in the same spot as the situation above, you will shoot at side armor. "I guess I would have to add that gun teams would loose their dug in status if they fire at something outside the 90 degree arc"
IIRC - Currently in the rules, rotating a gun team does not cause you to lose dug-in status. The reasoning is - to lose dug in you must 'leave' your holes. Rotating has been ruled as a movement of 0". Pretty sure this is in MALFTF. It seems a little counter-intuitive, but remember that the gun teams' dug-in status represents slit trenches for the crew, not a full emplacement for the gun. yup, that is a good point. but again adds the idea that big guns need to stay in the back. at closer distances guns would have to "wheel" to shoot.